Have you had to sit in front of someone, look them in the eye and fire them? The anguish you feel leading up to that moment keeps you up at night. And that pales in comparison to snatching the livelihood from someone sitting an arms length away from you. Great managers don't take this responsibility lightly. Understanding that making the right decision – and executing this excruciating task well – is mandatory. Are all violations of company policy punishable? Who needs to be in the termination meeting and why? Debate: Should an exit interview be carried out? Can the golden rule really save your company a lawsuit? Chapter Four: How do you spell R-E-S-P-E-C-T? The best thing you can do to avoid wrongful termination lawsuits is to treat the employee being terminated with respect. Poll after poll has found that people are motivated to sue when they feel they have not been treated with respect by their former employers. 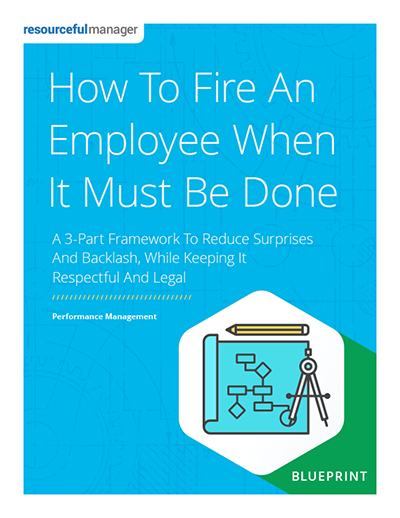 Follow the ResourcefulManager guidelines for showing R-E-S-P-E-C-T in terminations. The ResourcefulManager’s Termination Checklist ? ResourcefulManager's "How To Fire An Employee When It Must Be Done" Blueprint comes with an unconditional, 100% money back guarantee. If you decide "How To Fire An Employee When It Must Be Done" Blueprint doesn't deliver value or simply isn't your cup of tea, just email us at contact@resourcefulmanager.com within 90 days, and we'll process your complete, no-hassle refund in 1 business day or less.